Firejail works by default on top of AppArmor, for example on Ubuntu and Debian where AppArmor profiles are available for several applications. In this release we bring in support for our own AppArmor profiles. If you run Firejail with –apparmor flag, the sandbox will use a generic AppArmor profile provided by Firejail, instead of the profile provided by your distro. Prevent information leakage in /proc and /sys directories. 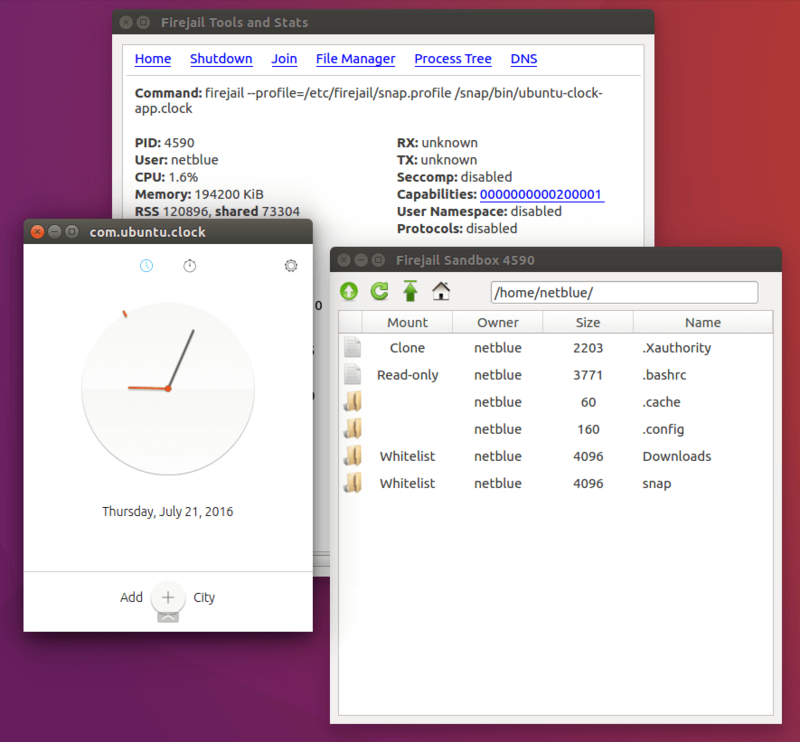 The resulting filesystem is barely enough for running commands such as “top” and “ps aux”. Allow running programs only from well-known system paths, such as /bin, /sbin, /usr/bin etc. Running programs and scripts from user home or other directories writable by the user is not allowed. Disable D-Bus. D-Bus has long been a huge security hole, and most programs don’t use it anyway. You should have no problems running Chromium or Firefox. You can also include apparmor command in a Firejail profile file. AppImage is what you use when you are planning a fundraising campaign for your open-source project. You would start from an older base, such as Debian Jessie or Ubuntu 14.04, and as you find you need newer libraries, you bring them into your package one by one. The result is an ISO autorun image that will work on most distros. Starting with your base, it will cover a few years worth of Ubuntu, Debian and Mint releases, all the way up to the latest Arch and Gentoo. I have an empty home directory (–private), a network namespace isolating the ssh server running on my workstation (–net=eth0), and I place everything in a different X11 server (–x11). Seccomp, namespaces and the rest are enabled by default. You can find more information on our AppImage Support page. 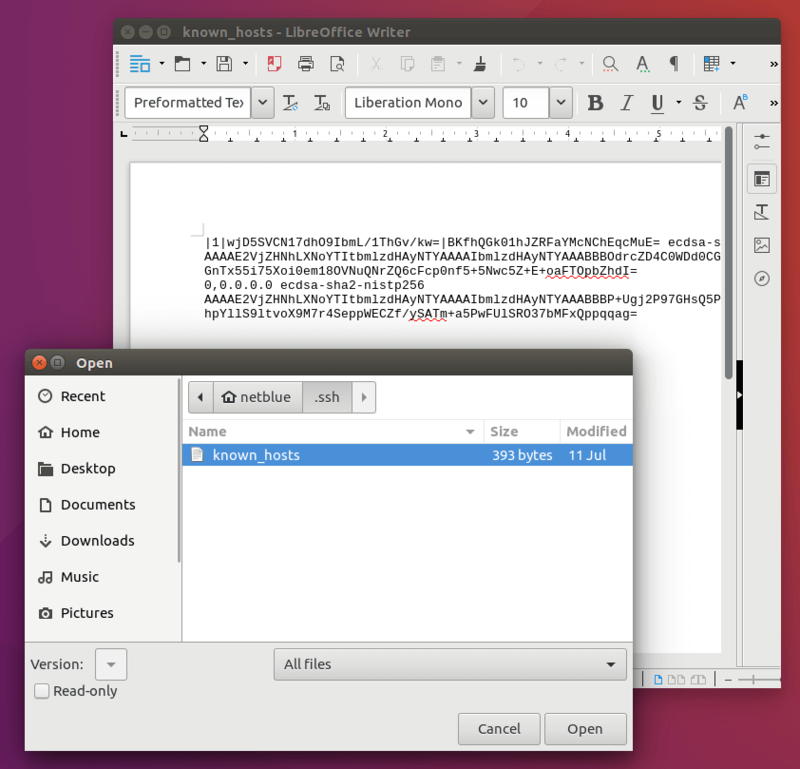 In the examples above, the sandbox configures transmission-gtk profile and starts the test program. The real program, transmission-gtk, will not be started. GOOD: process 5 is running in a PID namespace. GOOD: all capabilities are disabled. GOOD: I cannot access files in /home/netblue/.ssh directory. GOOD: I cannot access files in /home/netblue/.gnupg directory. GOOD: I cannot access files in /home/netblue/.mozilla directory. GOOD: I cannot access files in /home/netblue/.config/chromium directory. GOOD: I cannot access files in /home/netblue/.icedove directory. GOOD: I cannot access files in /home/netblue/.thunderbird directory. MAYBE: an SSH server is accessible on localhost. It could be a good idea to create a new network namespace using "--net=none" or "--net=eth0". GOOD: HTTP server not available on localhost. GOOD: I cannot connect to netlink socket. Network utilities such as iproute2 will not work in the sandbox. MAYBE: I can connect to session bus. It could be a good idea to disable it by creating a new network namespace using "--net=none" or "--net=eth0". GOOD: Access to /dev directory is restricted. Snap uses seccomp. It is not marketed as such, but later I’ve found a description buried deep in documentation. It has a good generic whitelist filter – actually I like the way they implemented it. AppArmor plays a major role in snap strategy. I would say you really need it if you are running snaps on a different Linux distribution. The home directory exposes user’s files, but not dot files. All this is done in the AppArmor profile. Your .ssh and .gnupg files are not available inside the sandbox. For sandboxing snaps we use the same strategy we used for Chromium: we let them fully configure what they have, and we insert Firejail in the security pipeline. User home directory for a snap package. The story with flatpak is a little bit different. Flatpak is more a container engine than a sandbox, and has the same problems as any other container system out there: heavy downloads from untrusted sources. At least under Docker you can build your own container, but here you really have to download it. The software has a number of dependencies such as Gnome libraries, systemd, but the most surprising one is PulseAudio – at least for me ALSA refused to work with flatpak. Flatpack is still under heavy development, we don’t plan to add flatpak support in Firejail at this time. I have a question. 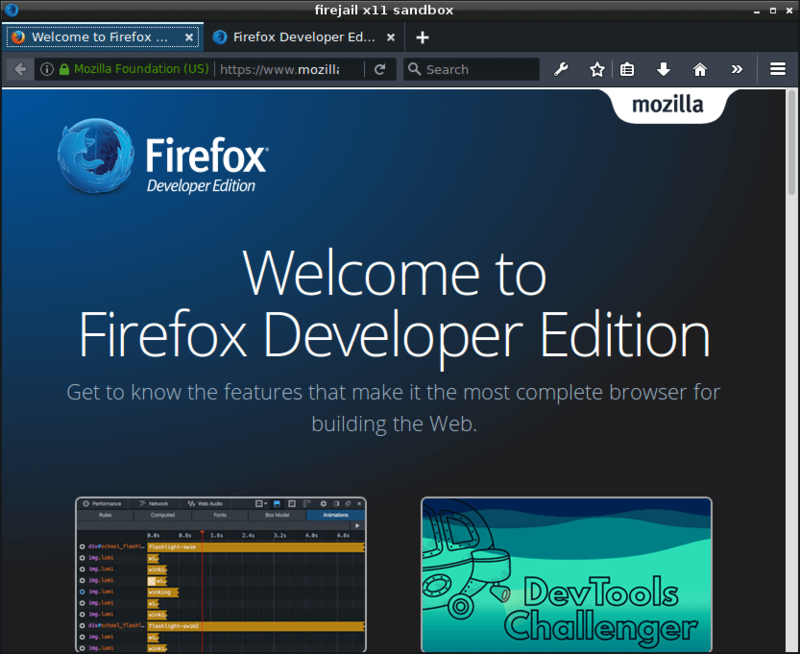 Is it possible to retrieve downloads if one is using the command firejail –private-home=.mozilla firefox with the default firefox profile? Yes, you would need to use –get command line option. Take a look in “man firejail” in FILE TRANSFER section. The –private-bin option conflicts with firejail replacement binaries/scripts in /usr/local/bin (and is a reason why bug #422 is a bad idea). I can’t load programs like eog (eom) because the private-bin profile is trying to add my /usr/local/bin version as the only binary, which doesn’t work (it’s calling itself, or really it’s calling firejail, which doesn’t exist, which is trying to jail the binary that is being called, so the process quits immediately). I confirmed this behavior by renaming /usr/local/bin/eog to eog and then executing firejail /usr/bin/eog. This works, but with /usr/local/bin, it doesn’t. I have /usr/local/bin higher in my path so that applications call the firejail version (I use a custom profile that I don’t want in /etc/firejail, so I need to use /usr/local/bin for wrapper scripts). The same problem exists for profiles with private-bin in them (how I first found it). If there were a way to specify which binaries to use (e.g., firejail –private-bin=/usr/bin/eog /usr/bin/eog), that would be appreciated. As is, I can’t use this great feature. Building firejail-0.9.42 as non-root fails on my distribution (Mageia 6), because /etc/login.defs is not readable (640 owned by root:shadow). Maybe also add a -r test for that file in mkuid.sh? I put a fix on GitHub, thank you for the bug. On my system, whereas Chromium runs beautiful with firejails default apparmor profile, Google Chrome for some reason fails to start…. …. lots of text …..
Where is Google Chrome installed? Is /usr/bin/google-chrome a symbolic link or some script calling the real program in a different directory? But when I call directly firejail –apparmor /opt/google/chrome/google-chrome, the result is the same (permission denied). I’ll have the fix in git by the end of the day, you can also try that version. No problem, if you find anything else wrong, let me know. Do you think blacklisting these locations would make sense? I´ve got a problem running snap-applications. I tried the following: firejail –profile=/etc/firejail/snap.profile /snap/bin/gnome-sudoku . It´s just the starting of installed programmes that fails. I think our support for snap was broken some time ago. We’ll try to bring it back. thanks for your reply. I´m looking forward to your future snap-support. No problem, but it will take some time – we have a new release coming soon, so it will be after this release.